We've seen what Marmell can do with drama and character, this chapter we get to get a taste of what his action is like. It's packing time in house Kallist and Vess, with the former not quite as good at it as the later. "I have what I need. It's not my fault you pack like a girl." "And I suppose that means you pack like a man, then?" "I, my love," she said, with a seductive twinkle in her eye and just a faint touch of her tongue on her lips, "do not do anything like a man." Kallist, still not emotionally steady enough to broach certain subjects, kept walking. Supplies gathered, and attired in as best as they could put together, our pair begins Mission: Warn Jace Beleren. And not a few moments pass when Kallist just can't help but ask Liliana about her reply. She stops him before he can finish and says to ask her when their mission's done. With Semner completely ignorant of the fact that his two prisoners are freed, the two of them should make the trip to Favarial right? Wrong. They walk the road for a bit, then in some run down area of city (like every other area in the city) they're attacked. Not by some simple thugs, but by what seems to be everything but the road itself. A creature made up of garbage, muck, broken glass, and anything that flows down the storm drain into the lower city attacks, summoned through some shamanistic ritual by sewer goblins for sure. Their out of place drums can be heard nearby. Everyone nearby slams their doors shut as the thing approaches, and there's no more League of Wojek like in the old days of the Guildds to take care of something like this, leaving Liliana and Kallist to fend for themselves. Kallist charges with his broadsword drawn, casting a good ol' illusion spell to hide him from the creature. Unfortunately the creature has no eyes to be fooled, and the creature attacks and nearly smothers him in mud and filth. It's not a good situation for our hero whose full potential has yet to be shown to us, so Liliana gets the creatures attention. The garbage elemental forgets all about Kallist and turns to face Liliana. When he's freed, Kallist sees why. She's summoned a dark angel who lusts only for death and desolation . The angel's strikes are deliberate and deadly and each strike decomposes chunks of the creature, but the thing so easy to kill. It isn't even properly alive. It eventually engulfs the angel like it had with Kallist before. Liliana is still too exhausted from summoning such a terrifying creature to her side so it's up to Kallist. He pulls out one of he crossbows recovered from the now dead guards, enchants a bolt, and fires. The crossbow bolt sinks into the creature... then... (did it work?)... boom! ...? The elemental doesn't seem particularly harmed, but it has slowed down. And despite what Kallist can see, it was enough for the angel to break free. Some of its skin was molted and gangrenous and one arm was broke, but its good arm still held a spear and it attacked once more. It dealt a critical blow, made eye contact with Liliana, and faded away to return to where ever it is that angels as dark as she reside. Keeping clear heads, both Liliana and Kallist run to the creature to finish it off. Liliana gets there first, and while she's busy, Kallist is jumped from behind by a tiny thing with enough momentum to knock him on his face. (He sure falls on his face a lot. I guess that's his thing.) Liliana takes care of that too, and tells him it was a sewer goblin. What were they doing there you ask? Well the pair quickly assume that Semner really didn't forget all about them and paid off some folks for just in case. The other goblins must have taken their pack with all their supplies. Now they have to travel with no supplies and with an exhausted Liliana who'll need time to recover, especially since they'll be steadily walking away from the swampy area that is particularly suited to Liliana's brand of magic. Again, I must talk about Liliana. I didn't think I'd like her as much as I do. Black has never really been my color. I've always been a Blue mage at heart, who at some point transitioned into a Blue/Green mage. And it's always hard to break the stereotype that Black creatures are evil in my mind, but Marmell has done a great job showing her to be selfish without defaulting to evil. This flirtatious and dangerous Liliana is a character I can get behind. Decent job. 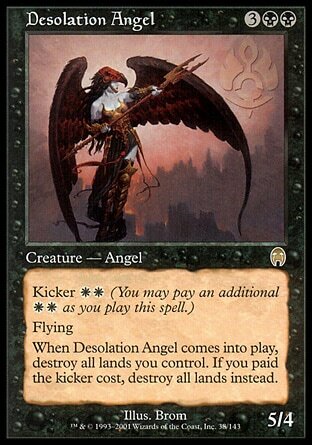 I wasn't particularly excited to read about a shapeless pile of garbage fighting our heroes, but once the desolation angel hit the scene my attention was caught. And once again the story isn't just about the blow-by-blow, but also we get to see Kallist's evaluation of the situation to really tell us what kind of trouble they're in and what his options are. It was done well. I'm impressed enough that I went ahead and ordered the hardcover version of the book on amazon. Some for the collection. Magic books don't usually come in hardcover, and amazon doesn't directly sell it anymore. It'll likely get more expensive to purchase as time goes by. Going for a walk and not walk? That's one of the big questions I hope is answered in this book. One of the biggest questions I have about the new Planeswalkers in general. How is planeswalking different than teleporting? What kind of energy and effort do they have to exert to walk the planes. Why don't they just walk to one plane, then walk back appearing in Favarial? In Scars of Mirrodin: The Quest for Karn, they had the excuse that they were already contaminated with Phyrexian oil and so walking to another plane would take that infection with them. Here, our heroes don't have that fear, and they might not even care if that was a possibility. In fact, I'm impressed enough that I want other people to be able to experience this book first hand as well. 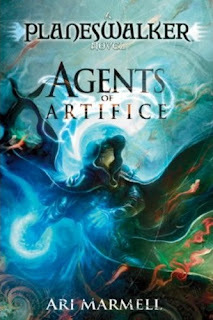 I know my drawing to give away a copy of Artifacts Cycle I is still ongoing (There's still time to enter! ), but I thought I'd give away a second book. This contest isn't for folks on Twitter. It's for you folks reading this right now. Thanks for reading in general, reading all the way to the end of this post, and thanks for returning day after day. - Despite not being a contest that will be advertised on Twitter, if you choose to post Anonymously, and - not with an easily confirmed ID, you will have to add your Twitter ID to the comment, so I can know who is who. - The winner will be announced later that day both in this thread, and as a new post, and will have 24 hours to respond, otherwise a new winner will be chosen. - The response will include both commenting again in this thread with a phrase I choose as proof that I'm communicating with the right person (Or through direct messaging through Twitter), and the winner will have to email me the address they want to book to be shipped to. Does that cover everything? I hope so. If there is some glaring mistake I'm forgetting (Forgive me, it's my first time), some adjustments might be made. This is my thanks to you guys for reading (and appreciation that the book is as good as it is), so please do not announce this contest on Twitter or elsewhere. Enter away, and good luck! I'd love to get my hand on that book, but I'm residing in Korea so the shipping charges would get out of hand :P Anyway, really am appreciating the work you're doing on this site! Heck, why not? Throw my name in the hat of "people who want to read this book thanks to you." Congrats! Hope you enjoy the book! Oh yes, and to Anonymous... Thanks for trying to think about my well-being, but now you just make me wonder how much it costs to ship to Korea. Amazon says they ship there, and it appears to be $5.99, which I'd be willing to do. If that's the case, feel free to enter in the next contest, I wouldn't consider that unreasonable.